Charlie first met the wild one when he was very young. They spent lost hours playing together in the great outdoors-- and when it was time for Charlie to return to school, the young lad was reluctant. School was for learning the names of planets. It was for studying Vikings and the wherewithal of electricity. It wasn't about tadpoles wriggling in exploring young hands or splashing in puddles or throwing leaves into the wind. Time passed but Charlie often thought of the wild one. He wondered if their friendship had been forgotten, yet when they met again, as teens, things were quickly like they used to be. The boys grow and Charlie becomes a doctor. Life becomes busy. His memories of the wild one seem but a dream, and when Charlie has his own child, he loses sight of the wild one. The only things he can see are the things his friend once loved. This is not only a goosebumping story about friendship and the cycle of life, it speaks of the risk of disconnection with nature and Real Life, as we age. It's also a story of hope, and a reminder that true beauty can be found in the simplest moments--of sharing and noticing the world around us. 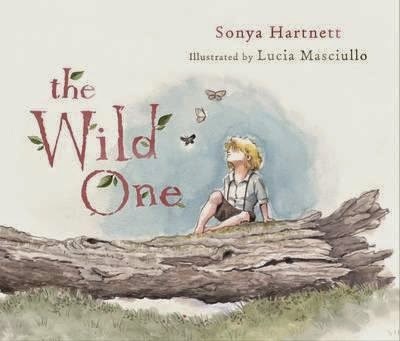 Harnett's lyrical text is portrayed perfectly by Masciullo's magical illustrations, resplendent with scenic vistas that will pull at the heartstrings of any Australian. The double page spread where to the two boys run amok, at play, is just exquisite to witness. How I wish I could join them, rolling and giggling in the grass, hanging from trees and sword fighting with twigs on fallen logs. This is what childhood really is. What can I say? Beautiful.